Item cross-references are used in a specific way. To ensure the desired item is chosen, configure item cross-references as identified below. Item Code: Exact match of the Vendor Part Number on the 850 with the Item Code in SAP Business One. Business Partner (BP) Catalog Number: Exact match of the Buyer Part Number on the 850 with the Catalog Number for the Trading Partner customer number in SAP Business One. Consumer Package Code (CPC): Exact match of CPC code on the 850 with the CPC Code in SAP Business One. 850 will not load if none of the above checks is met, or if there are multiple items in SAP Business One for the CPC code. Item Code is a direct (one to one) reference to the Vendor Part Number. This can be viewed on the Item Master Data: Inventory > Item Master Data. 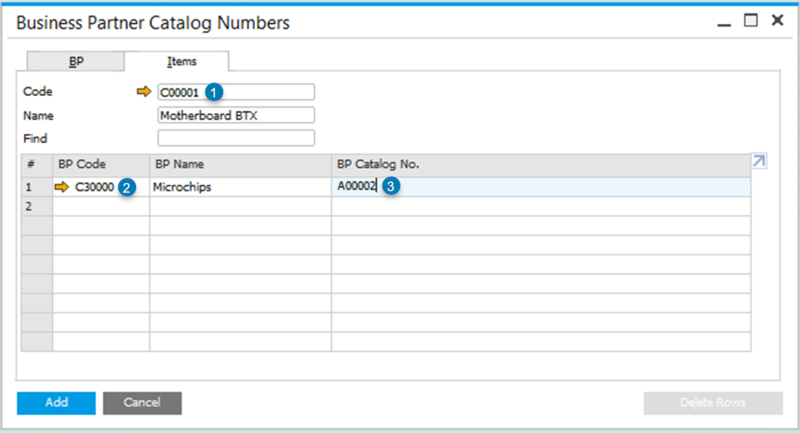 The Business Partner Catalog Numbers section (accessible from Inventory > Item Management > Business Partner Catalog Numbers) is used to map trading partners’ item numbers (Buyer Part Number) to SAP Business One item codes. Map Business Partners to trading partner (Vendor) item numbers as shown here. B1 Item Code (1) maps to a specific Trading Partner Item Code (3) for the identified SPS Trading Partner BP Code (2). 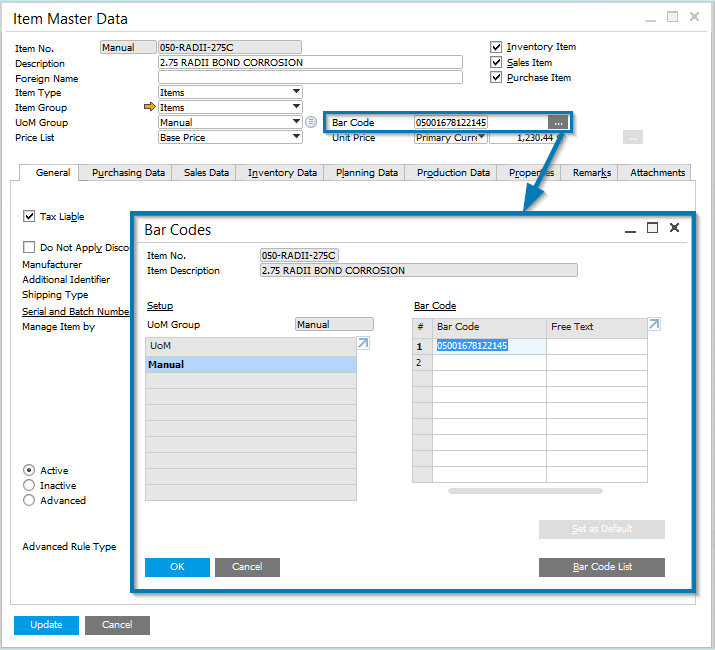 The CPC codes are mapped to the Item Code using the Bar Codes section which can be accessed directly on the Item Master Data or from the menu Inventory > Bar Codes. Shown here: CPC code mappings between the Item Master Data and Bar Codes.